Knowing no Japanese (other than phrases learnt from the anime my brother watched) and having never been to a foreign country, I prepared myself for the Japanese Media Industries and Cultures study tour. This included many travel guides, a handy phrase book, and a super-useful guide to navigating a Japanese menu. For this tour a group of Adelaide students spent two weeks in Kyoto, exploring Japan’s obsession with kawaii (cuteness), monsters and mascots, as well as going on excursions to television studios and museums to gain an insight into how the media culture and industry influences both local and global markets. Of course, being Japan, we were exposed to our fair share of anime and manga. 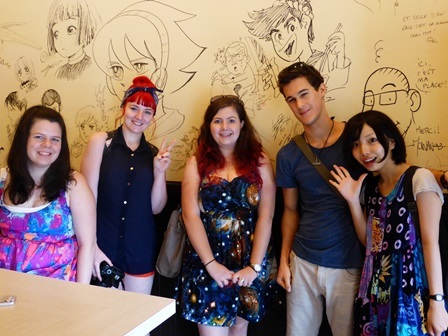 We got to visit the Manga museum where we all had a crack at drawing our own manga panels, and the adorable little café that sat just outside where famous manga artists have been drawing on the walls for years. There was also an excursion to TOEI Kyoto Studio Park where we got to experience ninjas, samurai, Power Rangers, a haunted house, an anime museum, and much more. While in Kyoto we were there for the biggest summer of the year, the Gion Matsuri. For this special event, the host university kindly arranged for the Adelaide students to dress up in yukatas (summer kimonos). 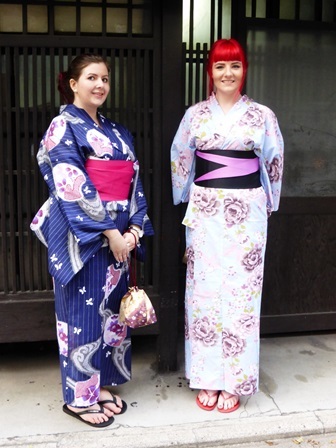 Navigating through crowding streets in these yukatas was quite a challenge, but extremely fun. I don’t remember seeing so many people in my life as I did that night. It was a sea of people flowing through the main streets in an orderly fashion, with people trickling off to the side to visit delicious food stalls, buy festival souvenirs, or try to find someone lost in the crowd during the mid-summer heat. That overwhelming and exciting night was spent gorging on food, attempting to find friends, and being politely asked by locals for a photo. This trip was not all lectures, classes, excursions and assignments everyday though. We did have free time on the weekend and in the afternoons to explore the city and its sights. With a bunch of new friends I met on the trip, we went temple hopping, discovered an amazing green tea parfait café (it’s Tsujiri Honten if you ever go), got lost in Nishiki Market, and went to Nara for a day to see the giant Buddha and be eaten alive by deer. While making these many memories, the two weeks flew by! It wasn’t until the end of my Bachelor’s degree that I realised how valuable this experience was. So, to make the most of it, I continued my studies by completing Honours in Media this year, specialising in magical girls in Japanese anime. Building upon the knowledge I gain during the study tour, and nurturing my newfound appreciation for anime, I dedicated this year to watching magical girl anime, attending anime conventions, and researching theories of anime and its attraction for Western audiences. Now that my thesis has been submitted, I can only wait with fingers crossed to see the final results! This entry was posted in Asia, Faculty of Arts, GLO News, Japan, Study Tours and tagged Faculty of Arts, GLO, Japan, Japanese, kawaii, Kyoto, staff, Study Tours, tbt. Bookmark the permalink.